Are you experiencing the fullness of God's grace? Or are you still trying to perfect yourself with human effort? 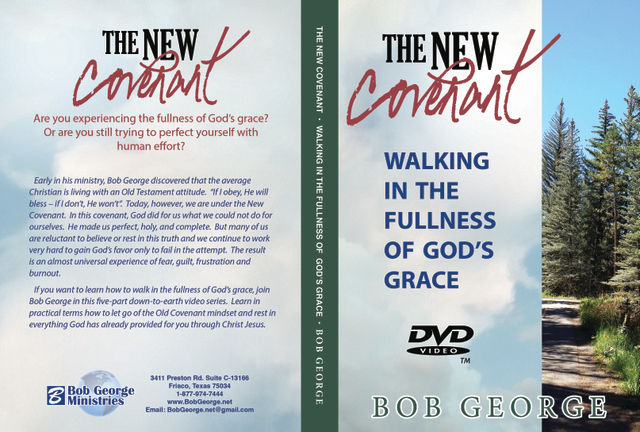 If you want to learn how to walk in the fullness of God's grace, join Bob George in this five-part down-to-earth video series. Learn in practical terms how to let go of the Old Covenant mindset and rest in everything God has already provided for you through Christ Jesus. Also available in our store is The New Covenant help guide. These video DVDs are excellent teaching tools for church groups, bible study groups and individual studies. Purchase 3 or more of this DVD series and receive a 15% discount on the DVD sets. Great to present as gifts and give them out to family and friends. I love Bob George teaching. He always teach so clear. I have to have The Signature. The New Covenant is a must-see for every Christian, and for those who have given up. We used this DVD over 20 years ago. We were in a very legalistic church that was actually cultic. God used this video and Classic Christianity to set us free. We then started Gospel of Grace Ministries and Christian School in PA and NJ and are still being blessed by the grace of God!